Walking onto a boat called “The Gust”, we loaded up our kayaks and supplies in preparation for an adventure. I looked backwards to see the orange transport ships from the cruises ship pass by as we set our courses to the open waters. Light grey clouds painted the sky, but the rain was holding back. Off in the distance, a hump back whale shot a burst of air from his blowhole and I realized I was no longer in man’s world. I was to spend the next five days in the South Baranof Wilderness with three strangers I had only met a few days ago during briefing. Ray Friedlander an intern with the SCS, Jonathan Goff our botanist, and team leader Adam Andis were to be my new friends as we headed into the wild. Our plan was to be dropped off in Whale Bay with a satellite phone, an emergency SPOT gps tracker, and a USFS radio linking us to the rest of the world. Our goal was to assist the USFS in collecting data reports and observations in preserving the wilderness in Whale Bay. Some hours had past as we came to rest upon a nice bay located near Port Banks. We unloaded all our gear and the kayaks on the shore and watched as The Gust slowly faded away off in the distance. We took our first paddle down to Port Banks and began taking notes of all the planes, jets, and boats that we observed and heard in the wilderness. As we paddled to shore, we observed an old recreational site where people had left some old trash. We packed up the trash and headed back to camp to burn what we could. It was our duty to take notes on the conditions of these old sites and for the next few days we would paddle up the large arm of whale bay visiting recreational site to recreational site and writing down our observations on the human impacts of the area. Jonathan would collect samples of invasive plants and he would educate us what types of plants were edible and native to the area. When I was 21, I headed to the Sierra Nevadas for two months as a part of my forestry degree, studying the scientific and professional dimensions of forest and wildland resource management. I received training in simple field orienteering principles, ran transects, cruised timber, and assessed the ecological conditions around Quincy, California. Being out at Starrigavan this past Friday with SCS’s Scott Harris and Kitty LaBounty and Foresters Chris Leeseberg and Craig Bueler, I felt nostalgic as we also ran transects, assessed forests for deer habitat, and sampled gaps for regeneration of herbaceous layers however there was something quite different about this experience—instead of university peers, we were working with students from Sitka High whose ages ranged from 15 to 19. 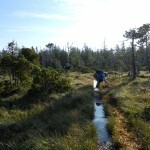 The Forest Team emerged unofficially three years ago as an occasional field trip opportunity to Starrigavan and False Island in Kent Bovee’s Field Science course, yet there is talk of having the program adopted into the curriculum for Sitka High’s Life Science course. This would guarantee every 10th grader field-based instruction on forest and wildland resource management topics in the hopes that these students will develop a better understanding of public stewardship and what this stewardship means for the forests that sustain us. What these students get to learn in the field is an experience many of us do not have until college. I watched the teachers hand off GPSs to the students, while the three stations they visited—the riparian stream station, the gap station, and the quick cruise station—equipped the students with transects, compasses, a plot mapper, and prisms to come up with data needed to assess the health of riparian and forest habitats. The gap vegetation monitoring the students did will eventually turn into a long term study about understory plant regeneration and will be published with the intent to spread awareness on the importance thinned forests have for growing winter deer food. Streams and forests together determine the health of Tongass watersheds. 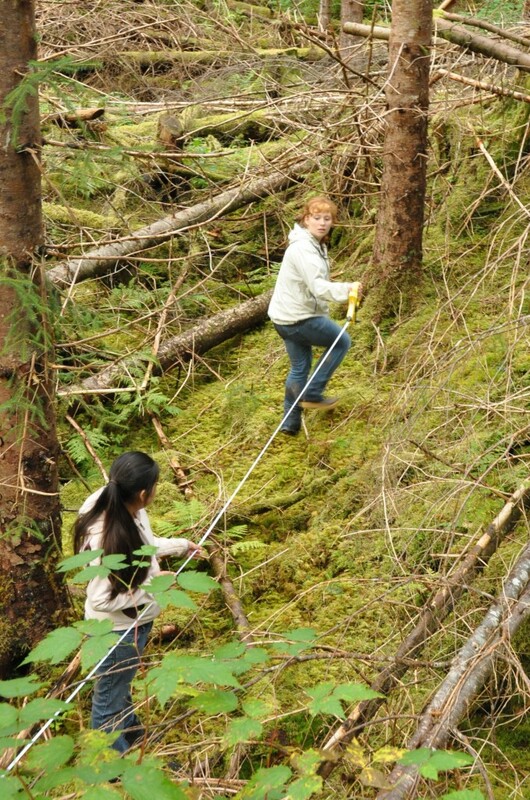 Sharing knowledge through field-based instruction gives high school students a clearer, scientific understanding of what goes on in the woods and also sheds light on career opportunities they could have as Tongass stewards. The value of salmon fisheries for ecosystems, industry, personal, sport, and traditional use is unquantifiable in Southeast Alaska. The lakes and streams of the Tongass National Forest contribute the vast majority of this pivotal resource- producing 79% of the annual commercial harvest, about 50 million salmon each year. 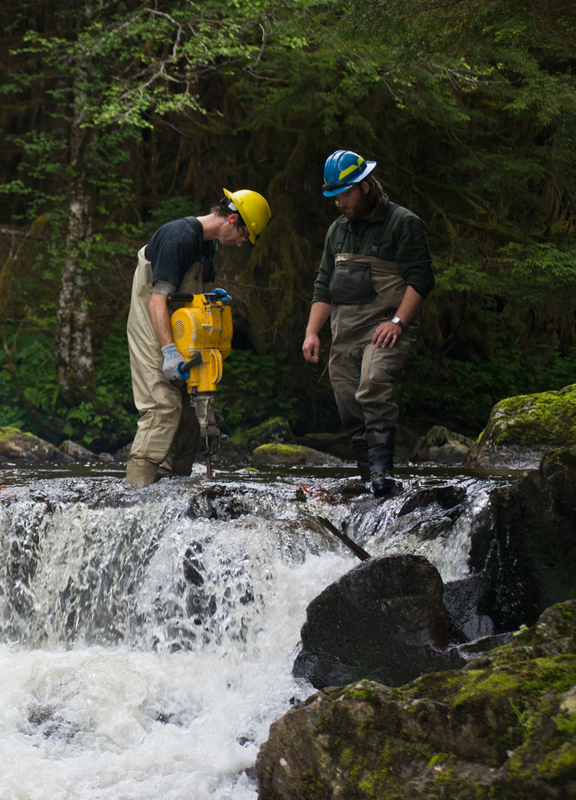 In its efforts to manage the Tongass for salmon, the US Forest Service invests in a variety of projects that ensure continued high productivity of fisheries and watershed resources. ‘Fish Pass’ installation has proven to be a powerful and effective option- an integral component of the Forest Service’s tool-kit to boost salmon production from Tongass systems. ‘Fish passes’ are constructed to bridge waterfalls that historically restrained salmon from accessing quality upstream spawning and rearing habitat. To protect the natural integrity of this lush national forest, the Forest Service adheres to a ‘minimalistic yet effective’ construction policy- minimizing environmental alteration while maximizing fish access. The vast majority of watersheds in the Tongass remain unaltered with only the most strategic and promising barriers selected for fish pass installation. Passes take many forms varying from nonstructural ‘step pools’ blasted out of natural bedrock to the Alaskan Steeppass ‘fish ladder’ that harnesses water current to push exhausted salmon to the top of barrier falls. Whatever the type, Fish Passes follow the same basic principle- allow more fish access to more area. Increased spawning and rearing habitat translates into less competition for space and nutrients with more salmon surviving to adulthood. Following this basic principle, the Forest Service has successfully improved production of Tongass fish. Fish Passes have opened access of 443 stream miles and 4,931 lake acres to spawning and rearing steelhead and salmon. Exact fish counts produced by increased area are difficult to calculate and are estimated by projecting the average number of fish produced given particular habitat quality by the amount of increased area. Conservative estimates suggest an average of 86,855 coho and sockeye and 227,500 pink and chum salmon adults added each year as a direct result of this increased area made available by fish passes. At the current rate of a dollar and ten cents per pound for coho and sockeye and forty two cents a pound for pink and chums, fish pass produced salmon add an impressive estimated $8,598,930- over eight and a half million dollars- to Southeast Alaskan economy over a ten year period. Unfortunately, like everything man-made, structural fish passes require maintenance to remain effective. There are approximately fifty fish passes across the Tongass- about fifteen operating in the Sitka Ranger District alone. The majority being between 20-30 years old, structural fish passes are reaching the point in their lifetime where they require considerable work. Managing this forest and recognizing that salmon are one of the most important outputs that benefit both humans and the overall ecosystem means continued investment in projects like fish pass construction and maintenance. We are fortunate to have learned from mistakes made across other regions of the world where wild salmon populations were pushed to extinction. We are even more fortunate to boast a talented fisheries staff and a holistic fisheries and watershed program that manage and protect the future of this valuable resource. Fish passes are one of the significant activities within this program that ensure wild Alaskan salmon continue to sustain the communities of Southeast Alaska and that the Tongass continues to rear the salmon that are base of the last remaining sustainable fisheries in the world. 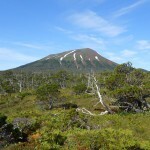 I can feel Edgecumbe in my muscles, and in certain parts of my feet and hips, I can feel the mountain in my bones. We planned this trip a week ago, and the sun agreed with a sky so blue and cloudless. A quarter to seven brought us to Crescent Harbor, and with a few safety instructions and tugs on our lifejacket straps, Alison and John Dunlap brought us to Fred’s Creek. The Dunlaps are the owners of Sitka Sound Ocean Adventures, and are long time Sitka residents who understood how fortunate we were to make it out to Mt. Edgecumbe on Sitka’s eighth day of summer. “Last time I was out here I saw a bear over there,” says John as the skiff settles into the sand with help from the incoming tide. We each jump out, confidently landing our hiking-boot-xtra-tuff feet on Kruzof not only as interns of Sitka Conservation Society, but as folks from Sitka and from down South—as folks in love with experiences that could only be labeled “Alaskan.” There were six of us—Ashley Bolwerk, Elizabeth Cockrel, Helen Schnoes, AJ Shule, Jonathan Goff, and myself—who chose water bottles, trail mixes, muskegs, forest patches, ups and downs, sun kissed skin, and deep inhales and exhales for our Tuesday. At times I was in front, feeling eager to reach the base in a couple hours, but we each took turns switching off who led, switching off who called water break, switching off who exclaimed “how beautiful is this.” Jonathan, an SCS botanist intern, would pause frequently to get closer looks at the plant life along the wood plank trails, at times even getting down on his knees to smell Deer Heart flowers and other blooms. Helen, one of SCS’s Sustainable Salmon Specialists, discovered her camera had a panoramic setting, and often one could see her body pivot in a circle as she tried to capture all of us within the wide landscape. “Thank you for waiting so patiently for us Edgecumbe,” I exclaimed as we got approached the rock steps at the base of the mountain. At the top, I kissed a rock I had found along the way and placed it in a pile started by other travelers who ritualized this experience. I carried my body on the flat earth to a spot that felt right, took off my pack, and gazed down into Edgecumbe’s naval, crescent-filled with white lint snow. Sitting down felt exotic. Eating lunch felt indulgent. 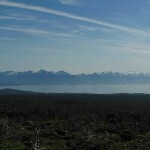 Really, to be sitting on top of a dormant volcano with my shoes and socks off on a sunny day in Southeast Alaska, overlooking forests, mountain ranges, ocean, and even seeing Sitka—this called for poetry, for odes, for screaming, and for all you yogis out there, this experience called for a happy baby. You cannot help but look and feel epic, you cannot help but feel your mind and body fused. “How do people seem pre Edgecumbe and post Edgecumbe?” I now ask Alison Dunlap. With scant water resources, water is a dramatic mirror of power relationships between Israel and Palestine, and water distribution occupies a central role in the peace process. To learn about the role of water in the Israeli-Palestine conflict, join photojournalist Skip Schiel for “The Hydropolitics of Palestine and Israel: A Slide Show,” Sunday, September 23, 7pm, at Kettleson Memorial Library. Based on his most recent trip to Palestine and Israel in spring 2012, the presentation explores the impact of water on people and activities on both sides of the conflict. 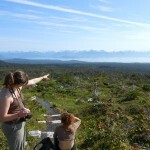 In July of 2012, thirteen undergraduate students from Knox College embarked on a 15-day wilderness expedition into the wilds of Southeast Alaska’s Tongass National Forest. 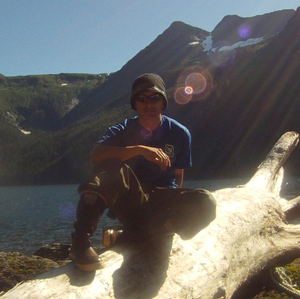 The trip was part of a semester long course entitled “Alaska: Forest, Fisheries, and the Politics of Wilderness”. 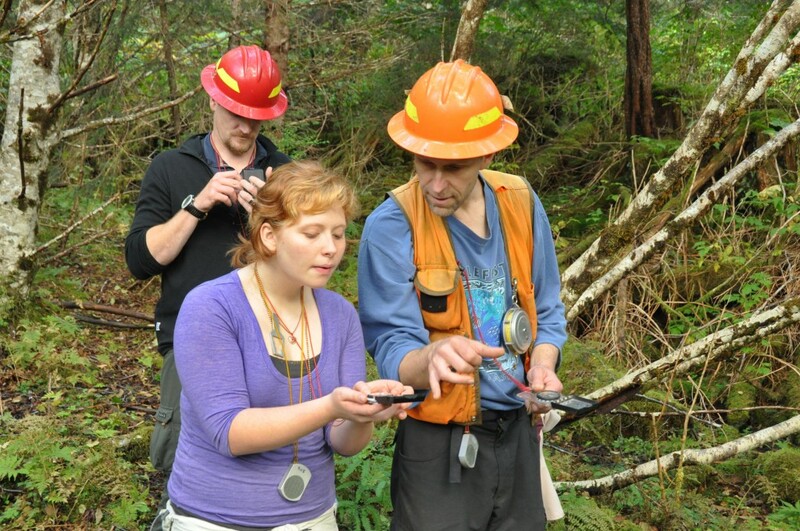 The course entailed an in-depth study of the history of natural resource management in Southeast Alaska. The first part of the course took place on the Knox College campus in Galesburg, IL with a thorough exploration of the literature regarding natural resource extraction in Southeast Alaska. This classroom based study of Alaskan resource management was complimented with a 15-day field expedition to the region the following summer. This was the “hands on” component to what they had learned in the classroom. Opportunities like Knox College’s course are available for colleges and universities throughout the nation. It is the goal of the Sitka Conservation Society and the Sitka Sound Science Center to connect courses like these with our local assets. 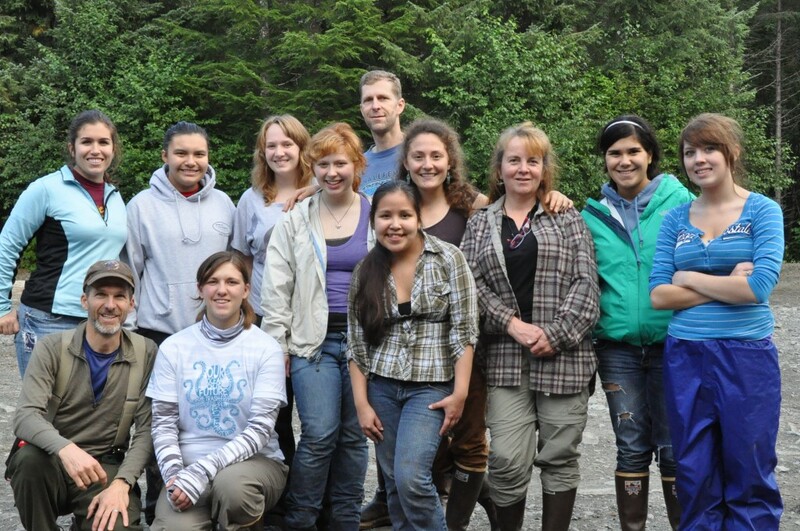 We can connect you and your students with our local experts, guides, interpreters, and organizations to facilitate your course’s Alaskan education.